A while back I interviewed my friend Emmanuel Eleyae, who managed to make over $65,000 in 4 months without Amazon by leveraging You Tube influencers. And over the past few years, he’s grown his satin lined cap business to over 7 figures by going all in on influencer marketing. Crazy right? Anyway ever since that podcast interview, I’ve been itching to try Emmanuel’s strategies so I decided to run my first influencer experiment on Black Friday of last year. Today’s post will break down my thought process, what I did, and the results of my first campaign. Editor’s Note: In case you are unfamiliar with the term, influencer marketing is where you pay someone with a large relevant audience to promote your goods. If you’ve been following my blog for any length of time, you probably know that I sell handkerchiefs online. My store offers the largest selection of hankies that specifically target weddings and other special occasions. But for my influencer campaign, I chose to promote a different product altogether. Why? It’s because selling wedding handkerchiefs is a time sensitive process. By the time we decided to run this experiment, wedding season was already over and the demand for wedding handkerchiefs over the holidays is not very high. So ultimately, my wife and I decided to promote our line of personalized aprons instead. 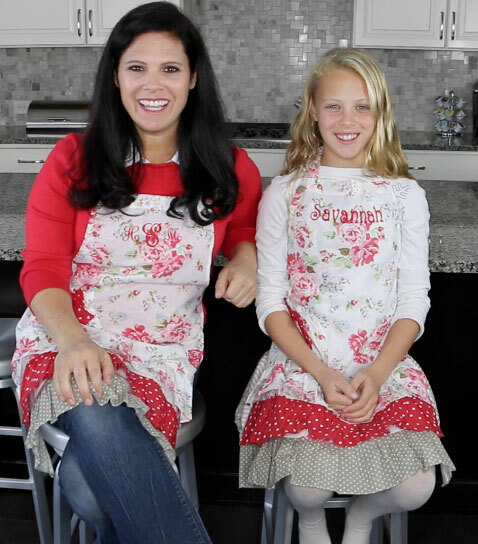 Not only are these aprons super cute but they make great gifts for the holidays. The type of product that you choose to promote can have a huge effect on the success of your influencer campaign and some products work better than others. For example Emmanuel’s company sells satin lined caps which address a major need among women with dry or brittle hair. His caps solve a real problem that millions of women are having and his products have broad market appeal. As a result, his satin lined caps are an ideal product for influencer marketing. 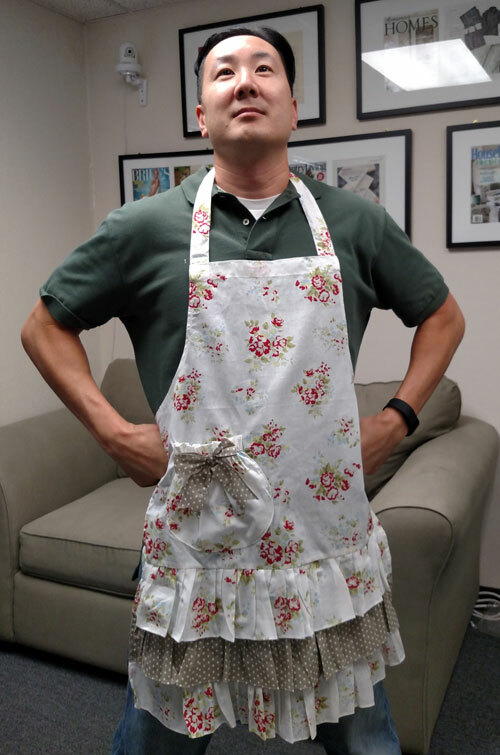 Our aprons fall into a different category. Sure, they are fun and cute but most people buy them as gifts for the holidays and Mother’s Day. Our apron sales are generally flat during other parts of the year and they fall under a person’s discretionary spending budget. Anyway my point is that if you sell a product that has mass appeal and solves a definitive problem or need, it’s an ideal candidate for influencer marketing. But even if your product falls under discretionary spending like my aprons, you can still generate a lot of sales with the right influencer on your side during the right time of year. 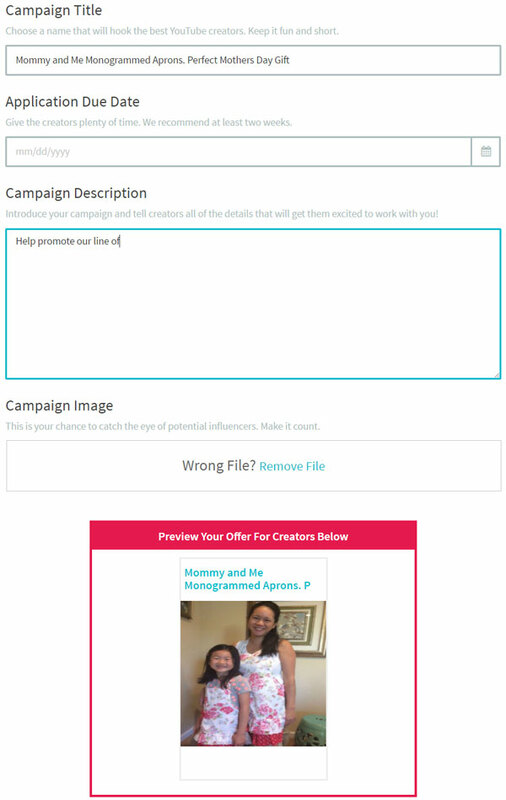 For my influencer campaign experiment, I decided to use a service called Gen.Video. 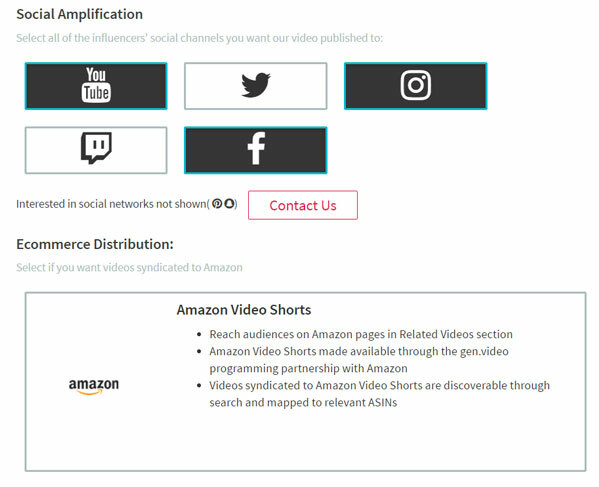 Gen.video is a marketplace of influencers where you can easily find YouTubers and Instagrammers to promote your products. Editor’s Note: Gen.Video is offering MWQHJ readers 25% OFF their first influencer campaign. Click here and apply coupon code: SELLERSUMMIT25 to redeem the discount. Not only is the marketplace huge, but you also have the ability to own the rights to your videos for outside use as well. As a result, you don’t really need to hire a production crew to produce your own videos. Instead, you can simply go on Gen.video and have an influencer make a custom video for you. The first thing you need to do is fill out an application and choose which platforms you are interested in. You can choose from Facebook, Instagram, YouTube, Twitter and Twitch. Describe what you want the influencer to promote along with a photo. Choose your budget. The size and reach of your influencer will depend on how much money you are willing to spend. Below is the approximate price to expect. FYI, my budget was $1500. 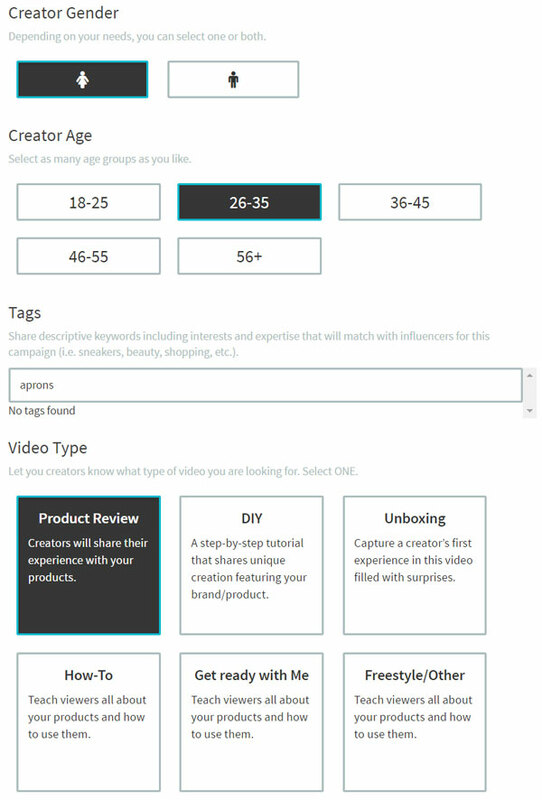 Finally, you specify the influencer gender, age and the type of video and hit the submit button. 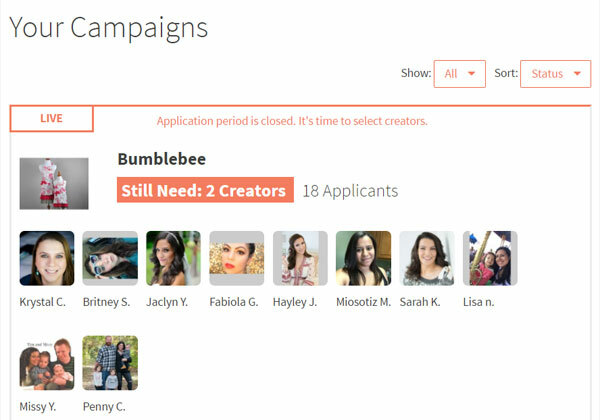 Within 24-48 hours, you’ll receive a bunch of influencers who are interested in promoting your products! Once you have a list of influencers at your disposal, you have to do your due diligence. You have to choose a person that will best represent your brand and drive sales. 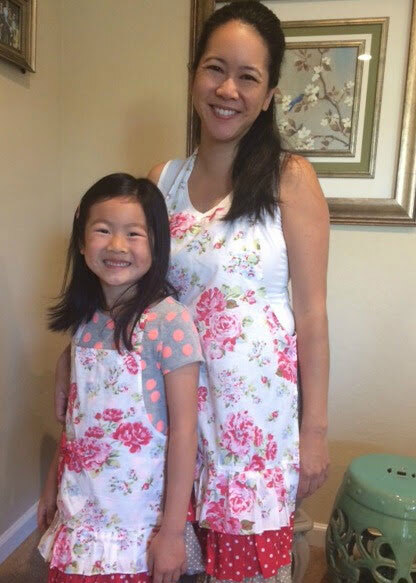 In our case, we were looking for a cute Mother Daughter combo who was used to producing product based videos. We also took the time to browse each influencer’s YouTube channel to get an idea of their style and the level of engagement. Ultimately, we settled on Hollie and Savannah of BabyGizmo! Aren’t they cute? Once you’ve selected your influencer, you have to send them your product and tell them the key value proposition you want to convey. In our case, we let our products do the talking and let Hollie and Savannah roll with whatever they wanted to say. We wanted to avoid using canned scripts so their presentation would come across as natural and fun. 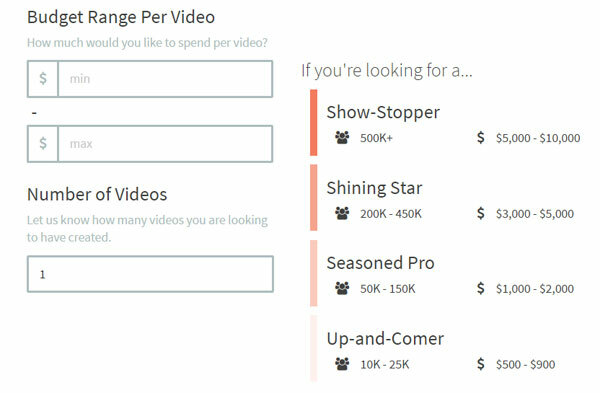 Once we communicated our video requirements, I took some time to plan the backend funnel. Most people who land on your site aren’t going to buy. In general, the average conversion rate for an ecommerce store is 2% which means that 98% of customers will leave without buying anything. As a result, you want to plug these leaks on your site. 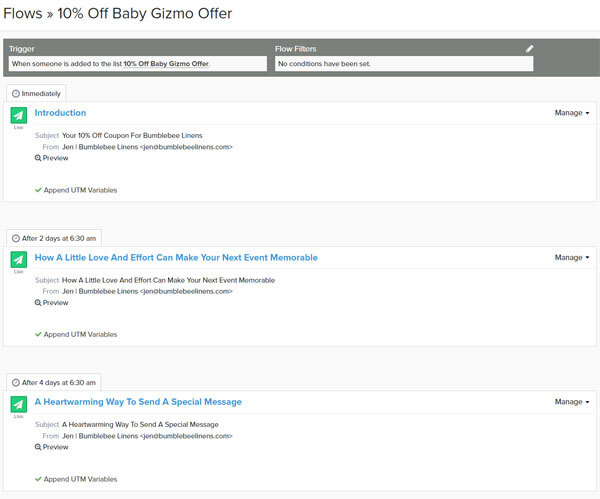 For BabyGizmo fans, I had Hollie use a special URL to drive watchers to a dedicated landing page where they could enter in an email for a coupon code. Here’s what the page looked like. In addition, I set up Facebook and Google retargeting pixels so I could run ads to interested parties. Once they signed up for the email list, I implemented a 20 step email autoresponder sequence to nurture the customer relationship. Our BabyGizmo video went live on November 25, 2016 and here are the metrics for the campaign. In addition, we placed these videos within our Amazon listings as well. 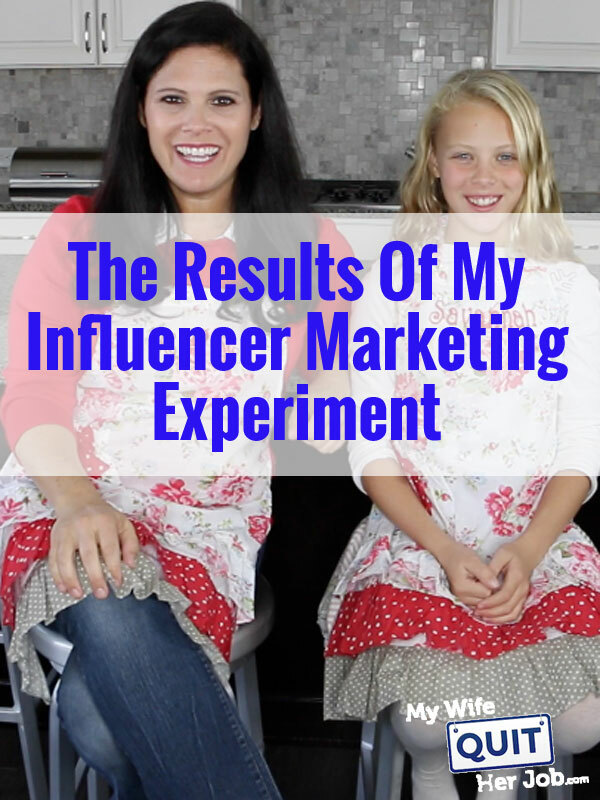 Measuring the results of any influencer campaign is extremely difficult because there are so many variables at play and it’s hard to isolate the traffic. While I would have loved for everyone to click on the link below the video, very few people did which made tracking problematic. These days, most people watch videos on mobile and don’t read the video descriptions. That being said, I tried to isolate the variables as best as I could by doing the following. I turned off all Google/FB/Bing ads to my apron products. Our aprons don’t rank on Google on their own so sales are primarily due to CPC traffic. I turned off all Amazon Sponsored Ads – The listings for our aprons on Amazon were relatively new and had 0-5 reviews prior to this experiment and were not selling in volume. I implemented a special URL and coupon code – This url was visually conveyed to watchers. Customers had to optin to email to get the code. In an ideal world, everyone would have clicked on the link below the video, opted in to my email list and used their coupon. But unfortunately, very few people clicked on the link, very few people used the special URL, and even fewer opted into the email list. As a result, I was forced to do my analysis based on a “before and after” approach. Note: I followed all of the standard protocols for tracking potential customers based on advice from Emmanuel. The only place I strayed was putting the coupon code behind an email wall. Had I just given out the coupon code, I probably would have had more trackable coupon conversions. As I mentioned before, our influencer campaign went live on November 25, 2016. I turned off all ads on November 18, 2016 as soon as I knew I was going to run this experiment. If you compare apron sales in 2015 with ads to 2016 without ads, you can see that the number of units sold were up approximately 42%. Therefore, I’m confident that the influencer campaign increased sales. Without ads turned on, my aprons typically get very little traffic. At the same time the YouTube campaign went live, I also added these videos to our Amazon listings under “Related Video Shorts”. All of our apron listings were pretty new and as a result, there’s no 2015 data to share with you. All apron listings had between 0-5 reviews at the start of the campaign and we sold a grand total of 7 units in all of October. Was our influencer campaign a home run? No. Compared to Emmanuel, our results were more like a base hit. However, we paid $1500 for this influencer campaign and I’m conservatively estimating that we got at least a 2-3X ROAS out of it. It’s hard to tell how many sales we would have had without the video and the fact that we launched the campaign on Black Friday somewhat muddied the waters for our Amazon numbers. The reality of the matter is that influencer marketing is often hit or miss and it highly depends on the influencer’s audience and the product you have for sale. One advantage that I had with my campaign is that BabyGizmo had a well known track record for driving product sales as they routinely review Mommy products online. If you decide to do an influencer campaign, make sure that your influencer has an audience that is willing to open their wallets and try to run your campaign during a time with the highest likelihood of generating sales. The cool thing about this experiment is that I now own the rights to the video. As a result, I can post it on my website and use clips for my Facebook ad campaigns! Want to try running an influencer campaign? Great post with super information. I noticed that you put the video on your Amazon page. Could you tell how you did that? Is there a blog post about this which I missed (or maybe you can write a blog post about it if you haven’t already)? Thanks, a lot of useful information in this post. Great blog! Great post,Thanks for Sharing your ideas. I have seen something relevant on Instant Forex Support forum.